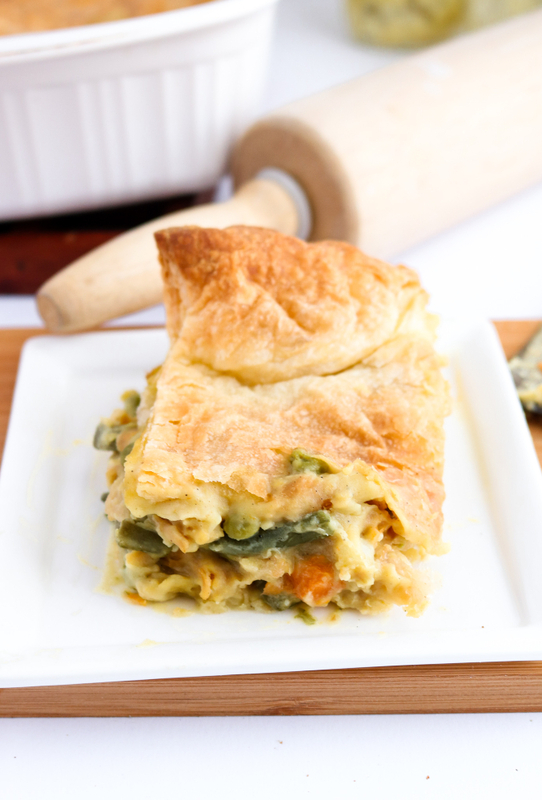 Vegan Pot Pie Casserole - an easy winter weeknight meal! 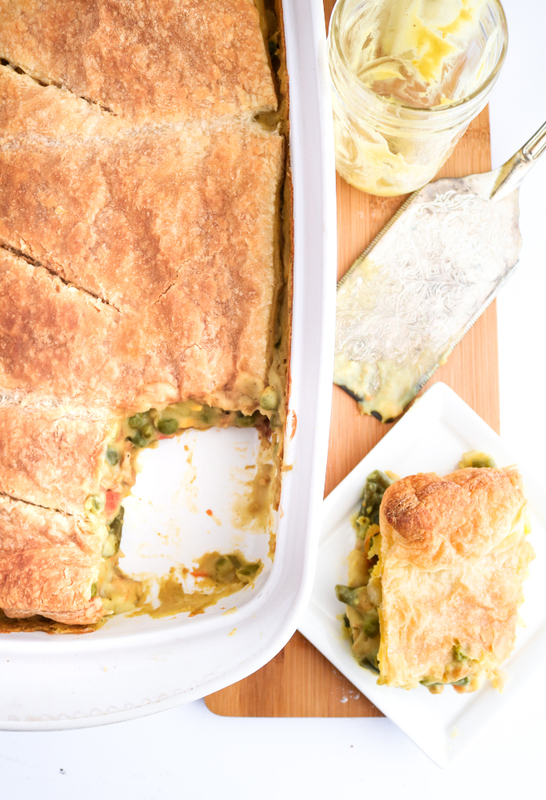 This vegan pot pie casserole is a quick, easy, and deliciously vegan version of the chicken pie I fell in love with in London. Made with tremendously simple and easily found ingredients, the hardest part is waiting for it to finish cooking! I will never forget the first time I tried chicken pie. It was on a college trip in London in the late ‘90s when I came out of the British Museum feeling peckish. I strolled across Russell Square on an extraordinarily temperate January day and came upon a quaint little 18th century pub known as the Queen’s Larder. Immediately taken with the decor, I settled in for a pint, ordered, and when the dish came out, it. was. glorious. The publican set a steaming tureen of chicken stew topped with a puff pastry crust. I think I may have almost cried at how beautiful it looked. You know those dishes that are almost too beautiful to eat? It almost was, but it was so good, I ordered a second. The look on his face when I did… LOL!!! 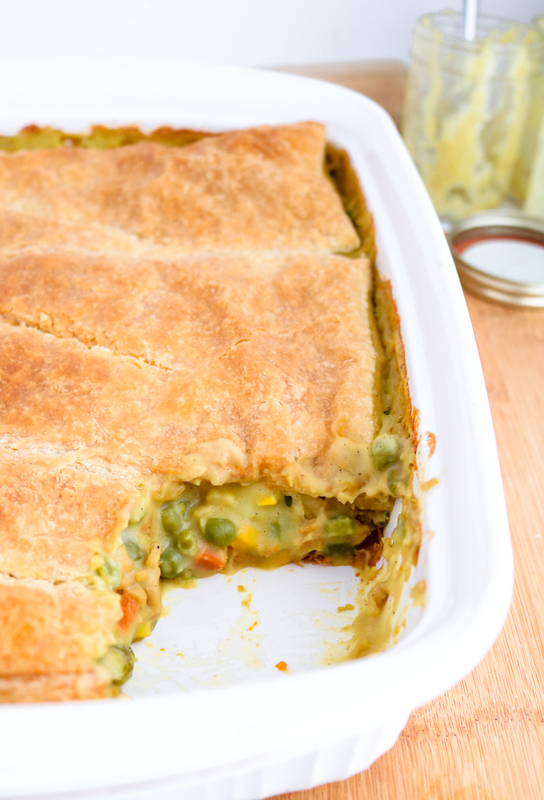 You are absolutely going to love this vegan pot pie casserole too. It’s SO easy, but it looks like you spent so much time and effort on it that your friends and family will be so appreciative. Their eyes will widen at the beautiful puff pastry crust as they lean forward to get a better smell from the steaming stew inside. And when they taste it!! They may just thank you for loving them so much to have made this for them. Made with tremendously simple and easily found ingredients, the hardest part is waiting for it to finish cooking! You roll out your puff pastry, and throw the bottom crust in the oven to bake. Then, you’ll throw all the filling ingredients in a pot to pre-cook a bit. Finally, assemble everything in the casserole dish and bake until bubbling and beauutiful! This vegan pot pie casserole is a quick, easy, and delicisously vegan version of the chicken pie I fell in love with in London back in the 90s. Made with tremendously simple and easily found ingredients, the hardest part of this dish is waiting for it to be done cooking! Start your crust: Preheat your oven to 400F and roll out 1 sheet of the thawed pastry for your bottom crust. Lay it in the bottom of a large casserole dish and use a fork to pierce the dough 30-40 times in various places. 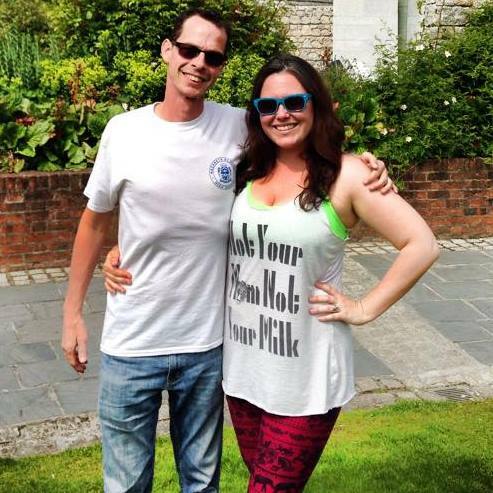 There's no pattern to this; you just want to keep the dough from rising to much. Then, place the dish in your oven to bake for 15 minutes. Prepare your filling: Add the water and diced potatoes to a large pot. Cover and bring to a boil. When boiling, turn to medium high and continue to cook, covered, another 5 minutes. Add the frozen mixed veg, cover, and bring to a boil once more. Finally, add your dry soy curls, condensed soup, salt, pepper, and onion powder. Stir the mixture, cover, and turn the heat to medium low for 10 minutes to let the soy curls re-hydrate and absorb all the flavors. If you'd like smaller soy curl pieces, use a spatula to cut up some of the larger soy curls once they're re-hydrated. Finishing touches: Carefully pour the filling over the bottom crust in the casserole dish and roll your second pastry sheet to a size slightly smaller than your casserole dish. Carefully lay the pastry on top of the filling, cut three long diagonal slits down the middle to let steam escape, and place the dish back in the oven for another 20 minutes or until the crust is a nice, golden brown. Let cool for 10 minutes upon removal, and as the scents begin to waft through the house, take a moment to revel in the glory of what you’ve just made. Store leftovers in an air-tight container in the fridge for up to a week or the freezer for a month. *Use any frozen mixed veg you like! We dig the mixed bags of diced carrots, corn, peas, and green beans from Target. Hi! Question about the ingredients list. When you say a “full batch” of the condensed soup, is that one 8oz mason jar or the entire amount the recipe link makes (3 - 8oz jars)? Excited to make this!! Hi, Lauren; great question! You'll use all three jars of the condensed soup in this recipe. Yay! So excited for you. Let us know how it goes! Hi, I find this a little misleading... puff pastry is made with butter. Do you a vegan alternative you recommend? Hi, Lena! Actually, most regular old store brands of puff pastry do not use butter and are *accidentally* vegan! Always be sure to check your ingredients, but we've never run into a brand that uses animal products. This is in the US of course, so it could be different elsewhere. But give it a look next time you're at the grocery store, and you'll probably be surprised!